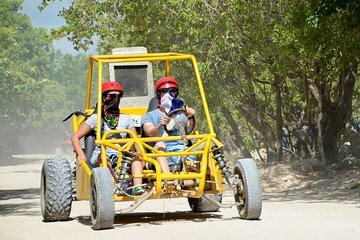 Go off-roading through the Dominican countryside in an all-terrain buggy during this half-day tour from Macao. Splash through muddy puddles and down rutted dirt roads in the Oriental Mountain Range, passing palms and tobacco. Pickup and drop-off from Punta Cana hotels included. Following convenient pickup from your hotel in Punta Cana, transfer to a country ranch near Macao. Be sure to bring sunscreen, bug spray, a bandanna to cover your face, swim suit, water shoes, and old clothing you don't mind getting dirty. Meet your guides and get an introduction to the local landscape and its role in the production of Dominican exports, including tobacco, coffee, cocoa, and green tea leaves. You'll also learn about the country's signature aphrodisiac elixir: mamajuana. Ride over rutted dirt roads and into deep mud puddles, up mountains with panoramic views and end up at a cave with a swimming hole. Jump in to was off some of the mud, then head back out on the road toward the idyllic Macao Beach. Return to your Punta Cana hotel for drop-off at the end of your adventure.